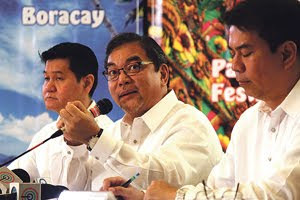 SEVEN of the top advertising agencies in the Philippines are working on the new tourism branding campaign for the country, according to newly appointed Tourism Secretary Ramon Jimenez Jr.
Jimenez revealed this as he batted for the “transformation” of the Filipinos into “enthusiastic selling units” for the Philippines. He said he believed strongly in the “commercial viability” of the country. In his first press briefing on Monday, the DOT chief said the new tourism slogan will be done before Christmas. “It’s important to point out that we’re taking this very seriously. It’s going very well. We’re in the middle of the process. This is not yet the end of the process. This exercise involves six to seven of the largest creative advertising, marketing communication teams in the country,” he said. According to sources within the Department of Tourism, Jimenez’s branding project is a continuation of what former Tourism Secretary Alberto Lim started in July 2011. The same sources said the bidding process was temporarily suspended because of the change in the administration of the agency. “We wanted to allow Secretary Jimenez to review the process first before proceeding,” a ranking tourism official familiar with the project explained. The TOR specifies that the winning bidder should be able to produce the tourism country brand as a multimedia campaign “with applications on investments, services and trade, to include concepts” for television, radio, print, online pages, web site, social networks, blogs, posters, billboards, transport and road shows or events. The TOR added that the creative materials for the branding exercise will include: campaign logo and theme line, visual identity guide manual, one five-minute audio-visual production (AVP) produced in high-definition; two 30-second AVPs convertible to 15-second TV commercials; two brochures; two print ad materials; and five posters. They can help, he said, by posting beautiful photos of local tourist destinations they have visited. “Imagine if you have 22 million Filipinos on Facebook doing this, this would be great coverage,” he said. He added that the department would be using a lot of social-networking tools to help sell the country to travelers here and abroad. “We are a nation that is unsure about the viability of our product...the transformation has to be from top to bottom and to believe that we are in fact, commercially viable, that we are in fact among the greatest tourist attractions in the world, or one of the fascinating undiscovered places on the earth. Ang kulang na lang is the transformation of the people,” he said. The DOT had received a lot of flak for launching its “Pilipinas Kay Ganda” slogan in 2010, without being tested for its acceptability among target markets. The failed exercise led to the resignation of one of its undersecretaries.